Discover who knows what and who knows who across your company. Unlock 100% of your tacit knowledge for accurate talent inventory. 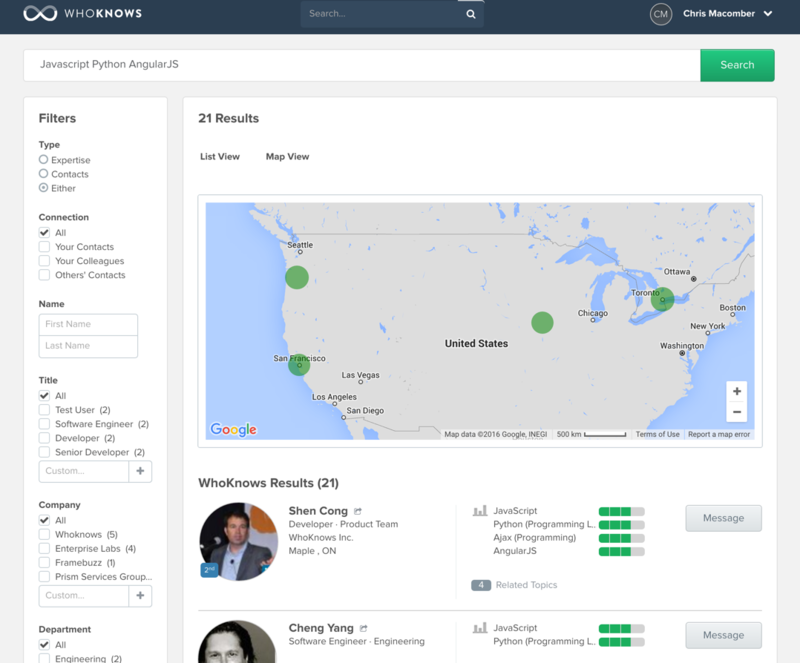 The WhoKnows Discovery Engine uses data extracted from user profiles, email, and web activity to gather skills and expertise. The user is always in control, and nothing is published to a profile without the users’ consent. Gain insight into the communication paths across geographies, divisions, teams, etc. 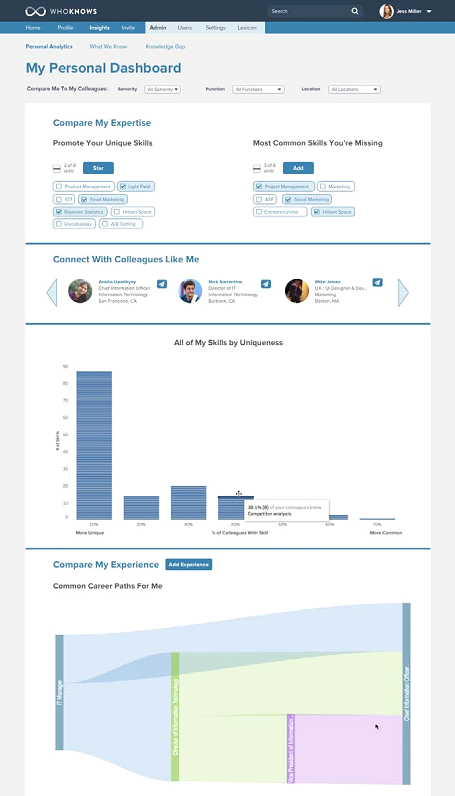 Identify influencers within your organization by identifying who are the most well-connected individuals and departments. Find the right colleague with our advanced search and filtering. Improve your staffing and collaboration by searching your WhoKnows network. 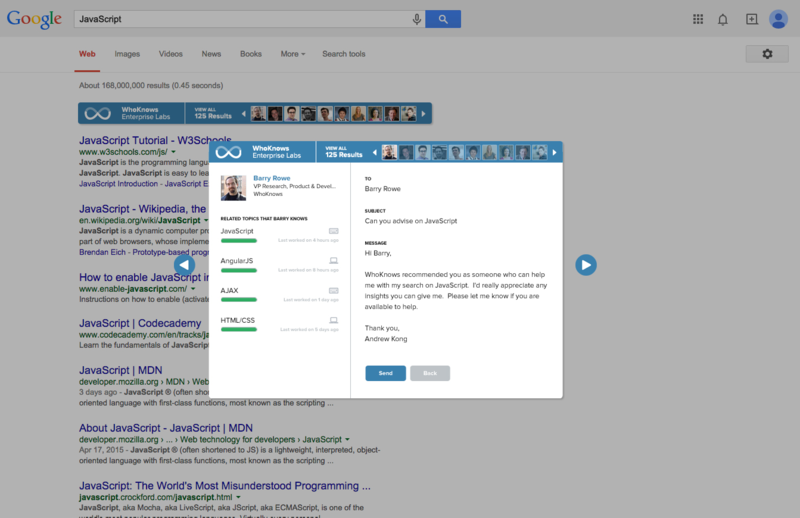 Search the colleagues in your network by their profile, expertise, or relationships. Refine the results with smart filters. Drill down into accurate and comprehensive profiles to better understand skills and experience. Map the search results within a geography, division, business unit or even seniority to refine search to needs. Reports and visualizations to accelerate your business. True insight into accurate, real-time data to make intelligent business decisions with a single dashboard. 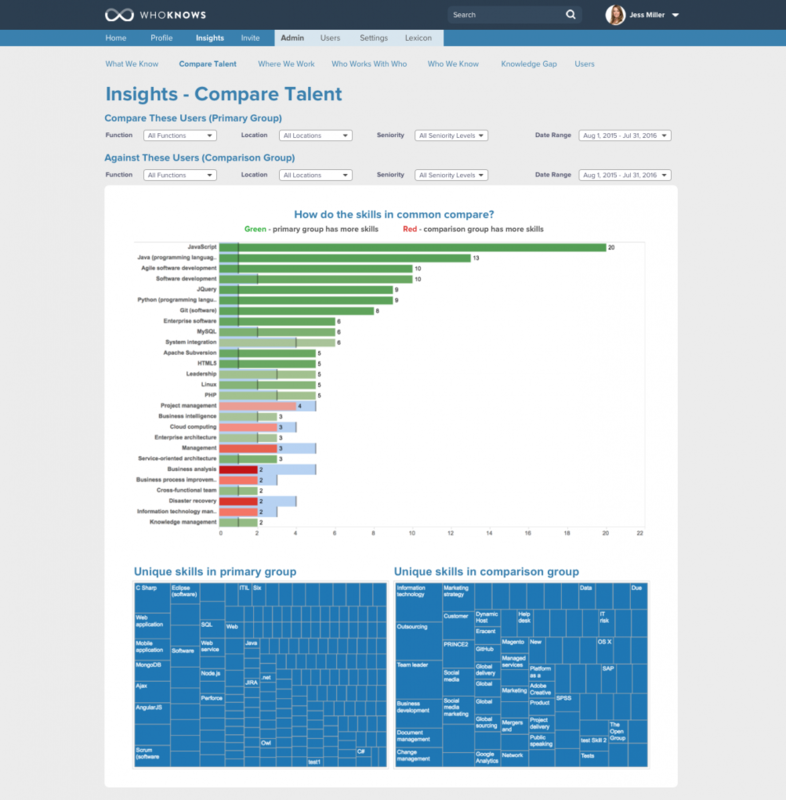 Discover talent analytics at your fingertips to better understand skills and experience for more accurate and reliable workforce planning. Gain insights into knowledge gaps and upcoming trends in new skills for better staffing and training planning. Increase enterprise collaboration by understanding valuable communication data as well as how people are collaborating. How big is your knowledge gap? Finally, understand what you need to know and whether you’re closing your knowledge gaps. The right colleague recommended when you’re looking for help. Bolster cross company collaboration without change in user behavior. Recommendations appear in all search engines, CRM, or web applications – this includes Google, SharePoint, Salesforce, etc. Seamless integration eliminates the need for training and allows employees the ability to instantly connect with their highlighted colleagues. Accelerate product development, research, development and engineering time to market with natural, cross-company collaboration. Start your own private corporate network. WhoKnows works for any size organization. 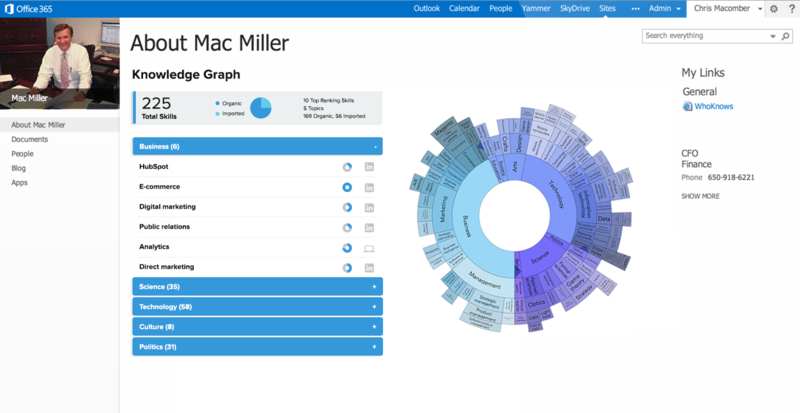 Customize your discovery engine by enhancing the default 6M business terms with your specific terminology. SSO via SAML authentication to expand your company’s network. Enterprise-ready security and privacy controls. Can be deployed via cloud or on-premise within days. Super-charge your apps with the WhoKnows developer platform. 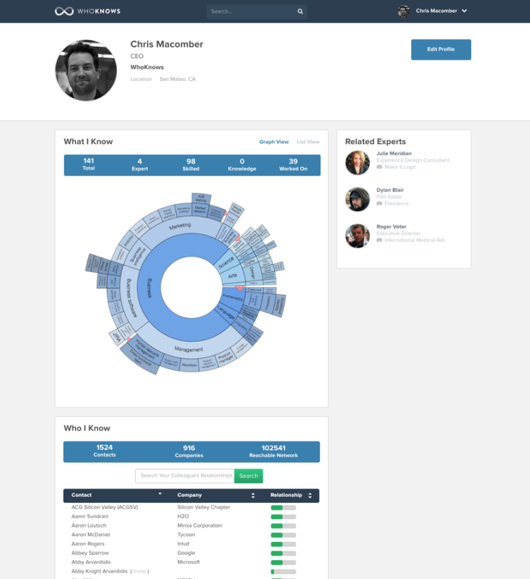 WhoKnows enhances your existing business applications with our embeddable profiles and APIs. 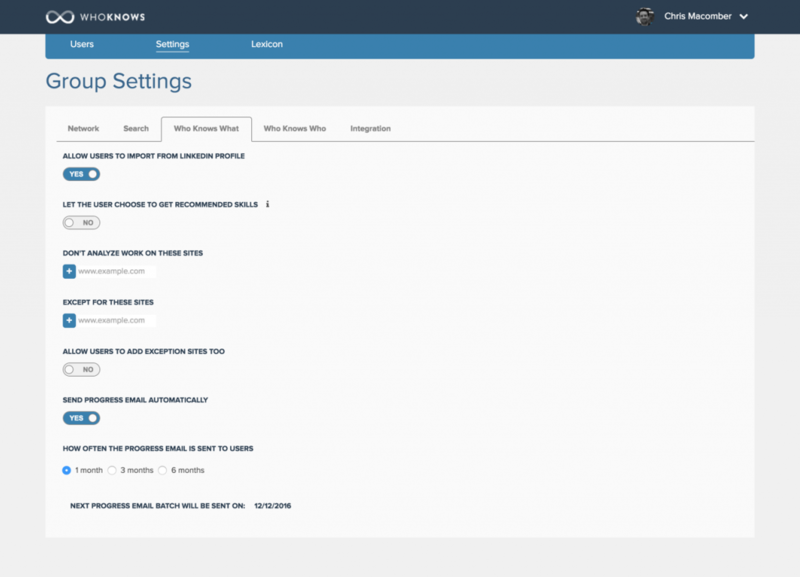 WhoKnows profiles seamlessly integrate into today’s most popular enterprise apps from day one (SharePoint, Chatter, etc.). Drive engagement and adoption to your existing collaboration platforms enhancing the value of existing investments. Full enterprise-ready REST API ready to integrate with your existing enterprise apps.